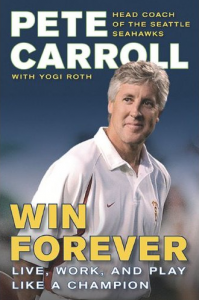 I just finished reading Pete Carroll’s book, Win Forever. I have to admit when I picked it up at the airport to read on my trip, that I wasn’t planning on being overly impressed. I thought I was simply getting a football book and I wanted to learn more about the Seahawks new coach. I have to say that I’m very impressed. The Win Forever philosophy espoused by Carroll is one I have always held but never able to express as well as he has. The whole concept is about competing (which we heard from Day 1), but not only in football but in life. I walked away with a couple of pages of notes on themes I will carry forward into my personal and professional life. When that happens, you know a book has been valuable. I find it fascinating that when Carroll was hired at USC after nearly 18 years in the NFL as a coach, coordinator, and head coach, he was thought to be a “pro guy” and wouldn’t succeed on the college level. Now, 10 years later, he is thought of as a “college guy” who can’t possibly inspire men. Ironic. In reading Carroll’s book, I genuinely come away liking the guy, the coach, and the traits. I believe the guy is a winner. The process in Seattle will not be quick, but I believe there is a purpose behind it. Heck, he started out 2-5 in his first 7 games at USC. From then on, it was a glorious ride. 1 – It’s got a terrific message. The philosophy of being positive and competing in all you do resonates in everyone’s life. I walked away pumped up and ready to play! 2 – Get to know the coach who is leading your team. Yes, I know he came from our arch-rival, however so did his protege Steve Sarkisian and he turned out okay so far. In fact, his Trojan background quickly faded with success, and I anticipate the same with Pete. I’m glad I bought the book. It’s an insightful, compelling and good read. Step back in time about 6 years. Had you heard that the Seattle Seahawks had just signed (in the same day) Washington WR Reggie Williams and USC product Mike Williams, you would have been ecstatic. It would have been a dream come true for the Seahawks Nation and Matt Hasselbeck, right? Well Seahawks Nation, your dream has come true. But now 6 years later, it’s barely front page news in the sports section. Both WR’s recently signed contracts to attend training camp in July. Their efforts at last week’s mini-camp gave them that opportunity. For both of them, it could be their final chance. Six years ago, these guys were the cream of the WR crop coming out of college. Reggie Williams was the 9th overall pick in the 2004 draft by Jacksonville. I watched the guy play at Washington. He was a freak. Great athleticism and speed. Lots of yards after catch. A “can’t miss” player. Mike Williams (no relation) came out the next year leaving USC early. He was the 10th overall pick by the Detroit Lions. M-Williams was the quintessential big WR. He was exactly the right guy to be the “go to guy” for any teams passing game. What happened? To be honest, I’m not sure. Bad decisions and injuries plagued Reggie. I’m not sure what the problem with Mike was, but he never came close to realizing his potential. Neither played in 2009. Reggie earned a shot at mini camp probably because of his local ties to Lakes HS and the U-Dub. Mike got the chance due to his ties with new Hawks coach Pete Carroll being his coach in Los Angeles. Both were signed and will have an opportunity to make this team. Both would have to be considered long shots. But, in a perfect scenario, can you close your eyes an envision both of the Williams boys finding the 80% of the skill they once had and bringing it to Qwest Field? If they both pan out (I know, I know, it’s a lng shot) the Hawks will have taken a significant step forward into being able to move the ball forward in their passing game. And Matt Hasselbeck will indeed then be thrilled.